You are here: Home / Fibro Warriors / Ann Smith: A Fibro Warrior Update! 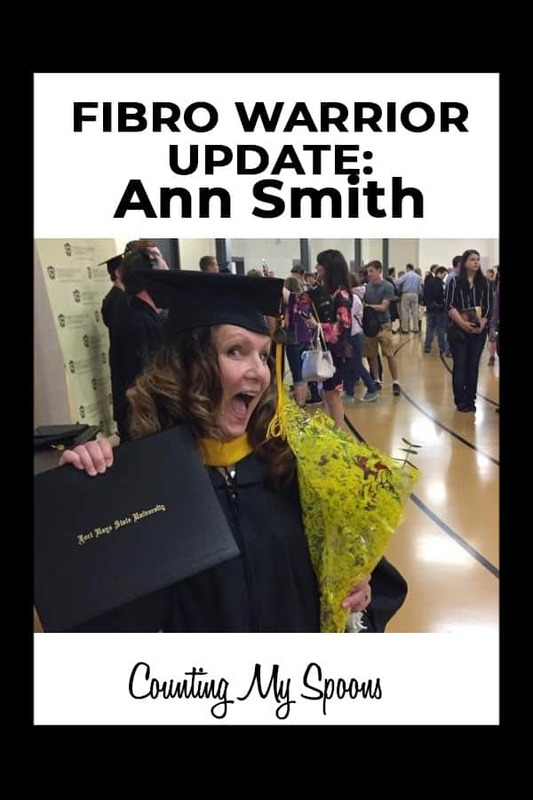 Ann Smith: A Fibro Warrior Update! Back in 2015, we got to know Ann Smith of Chanute, KS. She was diagnosed with Fibromyalgia in 2008 at the age of 34, after spending five years undiagnosed. Read her original interview is below and keep reading for the update. She wanted to share some updates to remind us all that happiness is possible and that we can still reach out and grab our dreams! I am a single mom with a 12-year old son. We have a hedgehog. I am a FANATICAL baseball fan, and go to as many games as I can. But I also love to spend time with my son and all of my family. Living in a small town and growing up with 3 older brothers, I was outdoors a lot and still love to fish, and just be outside whenever I can. Chanute KS is my hometown. My mom and one of my three older brothers live here. I’ve lived here the majority of my life, with the exception of the time I spent in college and married, having moved back here in 2008. What lead up to your diagnosis? After I gave birth to my son (I was 28), I started having what later became described as “Non-Descript, widespread pain”. Initially, my PCP and OB-GYN thought I had either Endometriosis or another condition with my reproductive organs. I went through a partial hysterectomy at the age of 31. When that didn’t fix anything, I then went through a battery of tests: my bladder was tested, I had a colonoscopy, and I had several MRIs and X-rays of every portion of my body. I kept telling my doctors that something just wasn’t “right”; that I didn’t feel well, and, for a woman of 31-32, I shouldn’t have to give myself a pep talk every morning just to get up and go to work. FMS was not something many had heard of at the time, so my PCP just kept throwing pills at me. How did your family initially handle your illness? It was extremely difficult at first… still is at times. My son’s father was dealing with his own emotional issues, so this put too much strain on our marriage. We divorced not soon after that. My mom, a retired nurse, did much reading on FMS and all of the litany of drugs I tried. She was, and still is, one of my best cheerleaders. My dad had a difficult time wrapping his brain around something he could not see; he became angry. Not at me, but at this demon that seemed to have taken over my life. My son, who was five at this time, was amazingly supportive and understanding. He is still my angel and my lifeline. What do you feel is the most challenging aspect of Fibro? I lost my marriage, a long-term relationship that followed my marriage, and many friends because of the sheer lack of understanding. I don’t like to talk about it because I refuse to let it define me. In many ways my internal struggle is horrific. I want a “normal” life. I have had to come to terms with the fact that my “normal” is not Norman Rockwell “normal”. I struggle with this fact DAILY. I want so badly to just be able to bounce out of bed every day, take on the world, and sleep through the night. But that just isn’t how my life path is going. Working on my degree has helped give me focus, so I can still keep moving forward… even if it is only one step some days. Do you have any other co-existing conditions? If so, what are they and how do they impact your Fibromyalgia? I suffer from chronic migraines. Sometimes a migraine and a severe flare go hand in hand. I also have a congenital heart defect. It doesn’t really impact my FMS, but to know it’s there is a little scary. What (if anything) have you found/ done that has improved your symptoms? I exercise. And by exercise, I mean I do yoga, walk, or use my elliptical, and do a TON of stretching. Exercising is not something I can do 7 days a week, or even 5. But I do try to get 3-4 days a week in. I am not sure if it truly helps, but it does help keep me in shape and gets me out of bed and off the couch. It also helps keep the depression at bay. How open are you with friends & family about your illness & symptoms? Not very. Honestly, I have sat on this questionnaire for a while. I don’t like to allow myself to get close to people, because it is so difficult to explain to someone what they cannot see and what will not show up on a test. If I am close to someone, however, I do my best to answer questions. What is the best advice you’ve received about Fibromyalgia? DO NOT PUSH YOURSELF. And, as a mother, a full-time grad student, a person who loves the outdoors, etc., this is extremely difficult. When I feel really great, I want to go and do and enjoy as much as I can, because I never know if tomorrow I am going to be able to get out of bed. But truly, pacing myself is the best thing anyone has ever told me to do. What was the worst advice that you followed? “Push through the pain”. Coming from someone who has no idea what FMS feels like nor what a person with a chronic illness goes through on a day-to-day basis, this is one of the WORST things that can be said to anyone in that position. What is your favorite way to cope with your life as a spoonie? Enjoying the little things. Anything ranging from a sweet text from a friend to a hug and an “I love you, mom” from my son. What is it that inspires you to keep going, despite your illness? My son. Period. He is the reason I decided to go back to school to get a graduate degree and his unwavering love keeps me positive when so frequently I just want to curl up in a ball and cry. What is one thing you’ve learned about yourself since your diagnosis? I am stronger than I think. And, in the face of something that has the capacity to be totally life shattering, I can still be positive more often than not. What is the most important piece of advice you would give to someone newly diagnosed with Fibro? Read, read, read. Become well informed of your condition, but also understand that YOUR experience is not going to be like anyone else’s. Do not be afraid to try new things, whether they be a new drug therapy or exercise or essential oils, but also do not be afraid to speak up and tell your PCP or specialist what works and what doesn’t. This is not a “one size fits all” illness, so it should not be treated that way when you go to seek a cure. I have to take pain medication because, for me, this has been the best way I have discovered to manage my pain. I get looked down upon a LOT and it used to bother me (still does in some cases). But I have tried many different types of therapy and I know what works for me. Being your own best advocate is your Ace in the Hole. Is there anything else you’d like the readers to know? It is very easy to curl up and disappear. And I know that many of us have had the feeling to do so, or maybe even have for a brief stint of time. As difficult as it may be, do not let the illness define you. Yes, you will have to make some life adjustments. And no, some aren’t fun. But life is still waiting for you to live it. We all need to know that there are still many of us out there, fighting the fight. So many things have changed in my life since I did my interview a few years ago. 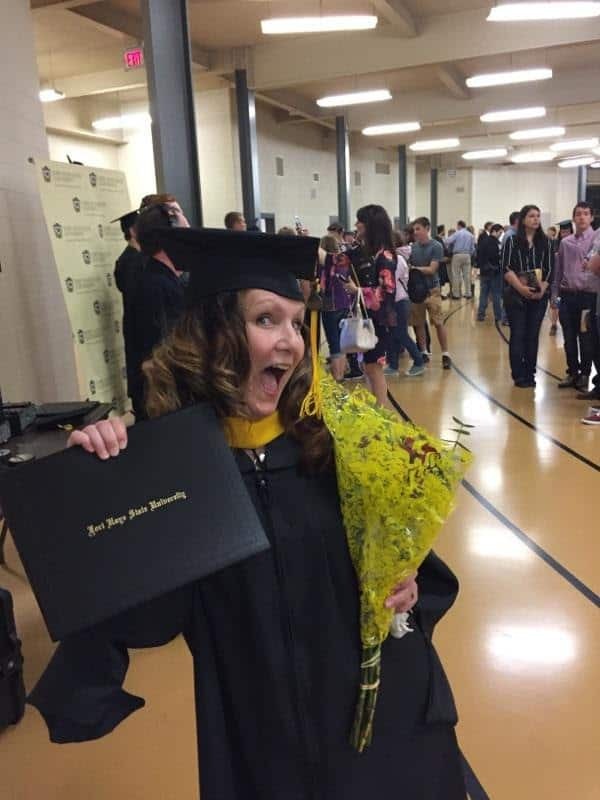 I graduated from Fort Hays State University here in Kansas with a Master’s degree in Special Education. I have attached a few pictures. One is me, after I received my diploma and hood, standing with my son (who is now 14). He continues to me my biggest supporter and cheerleader. 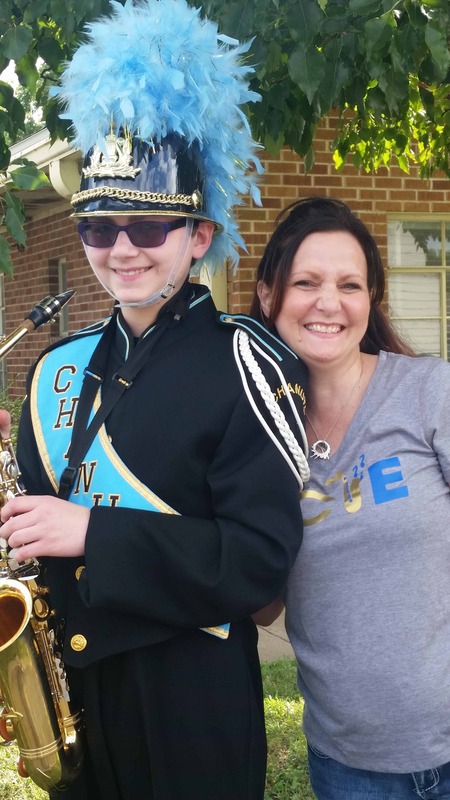 He is now a freshman in high school and plays the saxophone in the high school band. I have attached some pictures of him with me in his uniform, as well as a picture of him marching. To see him wear my high school colors with pride is a feeling that is totally indescribable. I’m so very proud of him and his commitment. Since I received my degree, I got a teaching job and currently work at a small rural school as an elementary special ed teacher. I love it. The experience has given me a new type of drive that is unexplainable. It’s absolutely amazing. I did have to have rotator cuff surgery in November that is unrelated to my illness, but it put me down for 6 weeks and I’m still healing. The surgery did, however, make me aware of just how much my illness can take out of me. But, being ever vigilant, I pushed through and did my best to not let myself get down. It wasn’t easy and I didn’t win the battle every day, but I didn’t quit fighting. As with every spoonie, living with FMS is still a daily struggle; I still have days when I don’t want to get out of bed and days when it is all but physically impossible to do so. I do what I can, I rest when I can, and I don’t ever, ever give up. 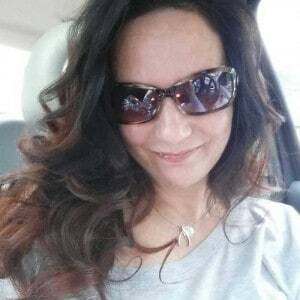 Ann welcomes your comments and would love to hear from you and connect with other #Spoonies. 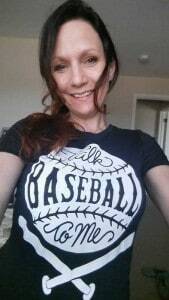 Please email her at lilbaseballgirl@yahoo.com. If you enjoyed this interview and would like to share your own story, please contact me. Spoonie. Fibro Warrior. E-health advocate. Located in Huntsville, AL. I've been diagnosed with Fibromyalgia, Endometriosis, Hypothyroidism, TMJ, Migraines, and Cluster Headaches. I share my journey here in an attempt to educate and inspire others who are dealing with similar health issues. Blog title inspired by The Spoon Theory, by Christine Miserandino, an excellent explanation of what it's like to live with invisible illness. I am not a doctor. I do not claim to be a doctor. I do not play a doctor on TV or the internet. I simply share my experiences and what has worked for me. We are all different and before you try any new treatment, exercise, supplement, etc you should talk with your doctor (the real one, not the one on TV).